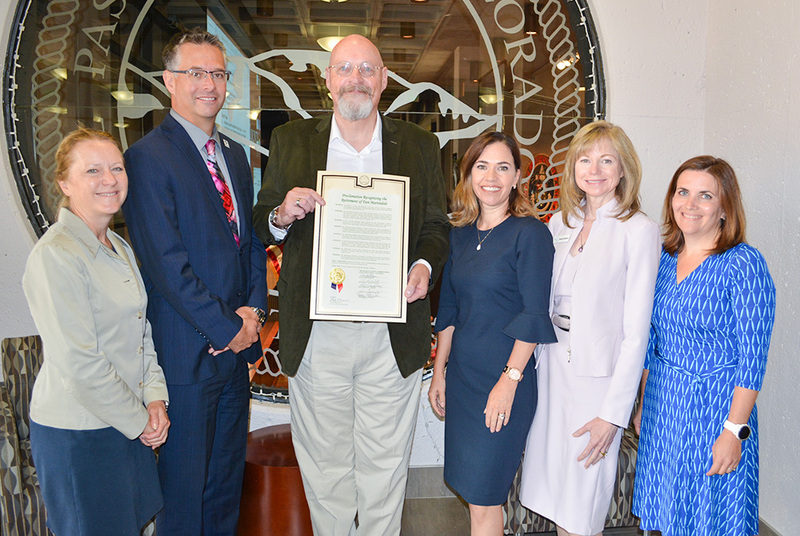 The Board of El Paso County Commissioners at its regular meeting on Tuesday recognized the retirement of Dan Martindale who worked for more than two decades with El Paso County Public Health (EPCPH). Martindale will finish out his career at the end of August as Director of Public Health. 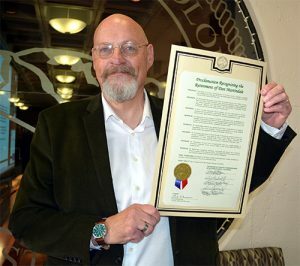 All those who spoke to thank and honor Martindale at Tuesday’s meeting spoke of the outgoing Director’s leadership and also emphasized a light-hearted approach that he had in running EPCPH. He was well admired for his wit and humor, they said as a slide show played on the Centennial Hall screen featuring Dan in various costumes including the more than 6-foot-tall man’s elf outfit. Deputy Director Tom Gonzales also talked about Martindale’s leadership at Tuesday’s Commissioners meeting. “He empowered all of us, his leadership team, his management group and all of his staff, to be better. He asked us to take strategic risks. He gave us the ability to strive for excellence. The relationships that we have built throughout the region come from his ability to believe in us,” Gonzales said. Martindale joined El Paso County Public Health in June 1995. He held various roles during his tenure, including manager of such programs as the Tobacco Education and Prevention Partnership, Maternal and Child Health, the Nurse-Family Partnership, and the Suicide Prevention Program. Dan took over as Deputy Director of in 2011 before becoming Director in 2014. Wheelan will succeed Martindale at the Public Health helm, assuming the role of Interim Director on Sept. 1, 2018.